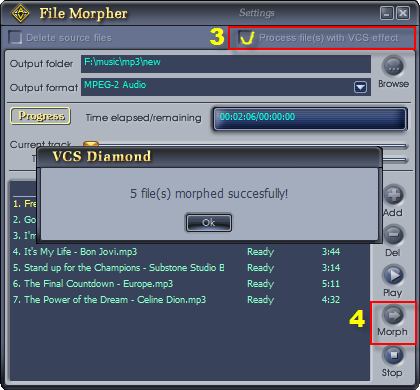 Morph vocal of audio files, AV Voice Changer Software Diamond 7.0 can do that, and even in batches. 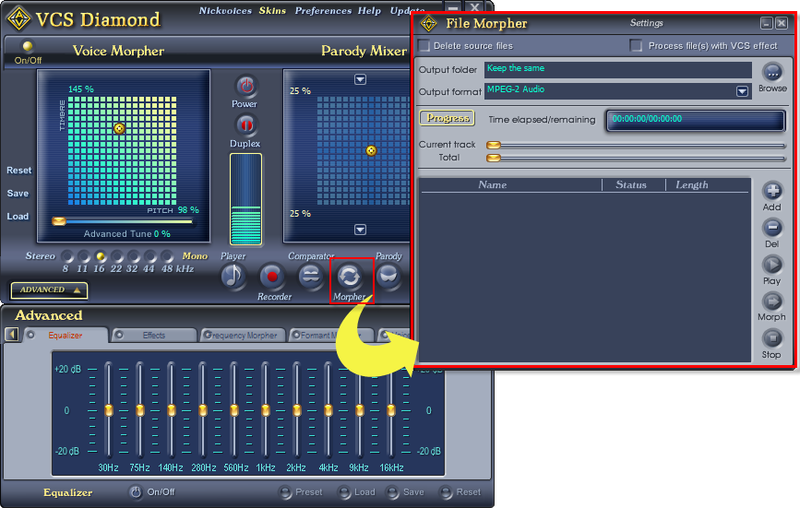 In this tutorial, we will show you how to edit and change vocal of audio files with the software. Check Play songs with morphed effects (1). This let you hear the song with all morphing effects you set up in the software. Click Open (2) to choose a file to test. Click Play (3) to play the file. Use the Pitch-Timbre graph, Voice Effects and Background Effects to make adjustments until you are satisfied with the output voice. 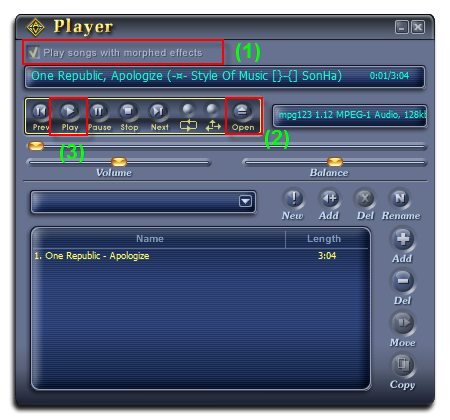 While listening to the morphed song, you can make changes on the main panel until you are satisfied with the output song. Click Close to close the player and then we choose output settings. Note: You should know how to use Voice Changer to morph voice better. On the main panel, click Mopher to open the Batch File Morpher. 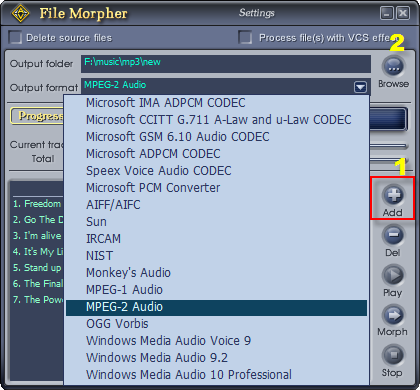 Click Add (1) to select all the audio files you want to apply the morphing effects. Click Browse (2) to choose where to store the output files when the process is done. Leave the other settings as Default if you don’t know which to choose. Default settings are the standard settings for audio files. Click Morph (4) button to start the morphing process. After all files have been morphed successfully, you can listen to the new files with the Play button. We do not recommend you to check the “Delete source files” checkbox (It will delete your original files). If you want to change the file format of the selected files, choose the new format from the Output format list. That’s it guys. Hope you all enjoy it. 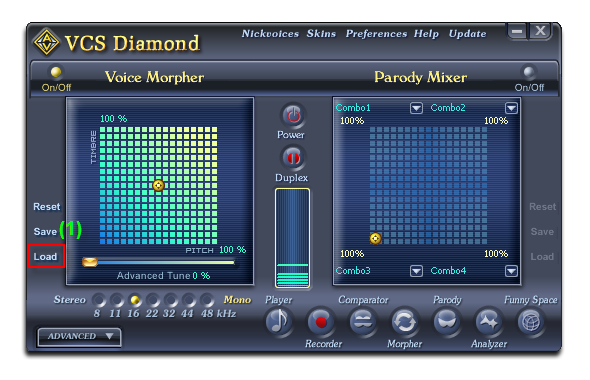 Did you know that AV Voice Changer Software Diamond 7.0 can help you mix different voices together and then create a completely parody voice? 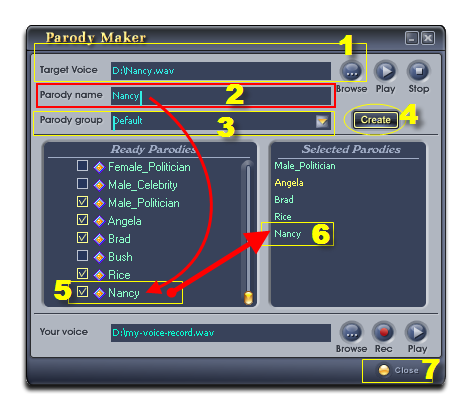 In this tutorial, we will show you how to use Parody Maker of the software. 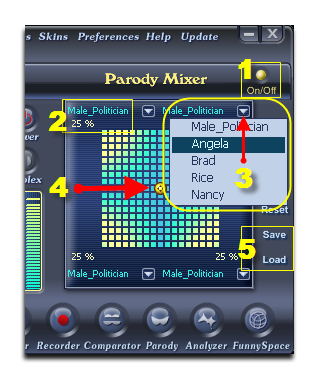 If you want to use Parody Mixer to mix different voices together, you will need to record your voice with Parody Maker first. On main panel, click on Parody to open Parody Maker. In Your voice section, click the Record button (1) and start speaking to your microphone. Click that button again to stop recording, fill in the file name and click Save to finish your voice recording. You can play back your recorded voice by clicking on the Play button. – Speak a short and simple sentence of about five to eight seconds. During the recording process, keep your voice clear and natural. – If you already have a record of your voice, click Browse (2) to choose it. The recorded file must be a mono audio file (stereo file won’t be added) and the record file must be *.wav format. 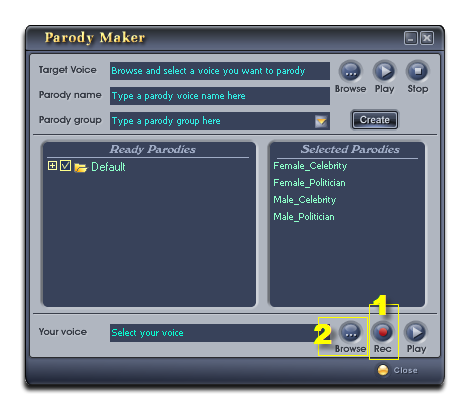 A recorded voice can be converted into a new parody by using the Add Parody module of Parody Maker. (1) In the Target voice pane, click the Browse button to specify a recorded voice. The path of the file will appear at the Target Voice field. Use the Play and Stop buttons to pre-listen to the voice you have just added. (2) Type the name of the parody into the Parody name field. It will also be the name of the parody when it is imported into the Ready Parodies list (5). 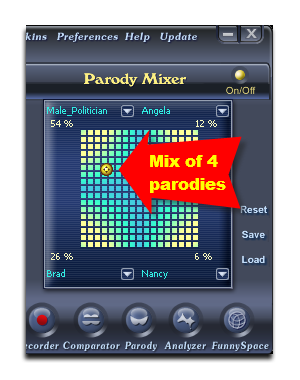 Choose from the Parody group combo box by clicking on the arrow of the combo box. (4) Click the Create button to create the new parody group and/or add the new parody into the specified group. The new item (5) will be added at the end of the Ready Parodies box. All selected parody voices (ones that have a check before it in the Ready Parodieslist) will appear in the Selected Parodies pane on the right (6). Click Close (7) to close Parody Maker. The newly added parody will be imported into the Parody Mixer. You are now ready to use the Parody Mixer. 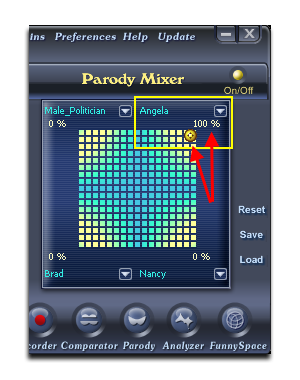 Turn on Parody Mixer (1). The number under the input voice name displays the similarity percentage between the output voice and the parody voice (2). Choose the Parody you want to mix (3) . You can choose up to 4 Parody Voices. The Parody Cursor (4). You can control from the four voices that your new voice will sound like the most. Click Save (5) to save your mixing as a new parody voice for later use. Moreover, you can use the Parody features with the Pitch and Timbre graph and the AdvancedTune simutaneously. Combining them will help you have the best output voice. You can totally mimic someone’s voice by moving the cursor to the edge of the table, which will imitate that voice 100%. In this tutorial, we will show you how to save your customized settings into a Nickvoice file, for later use. With this, you can always load your favorite settings and use again. Before saving our own customized settings into a Nickvoice file for later, you need to configure your own settings, right? 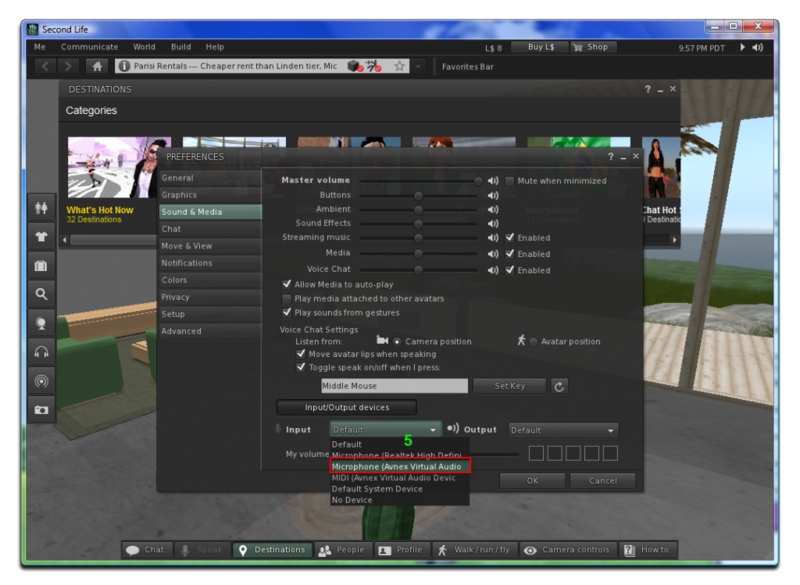 On Voice Morpher panel, click Save (1) to bring up Save As dialog box. The nickvoice file (.nvc) will be safely stored in your computer. 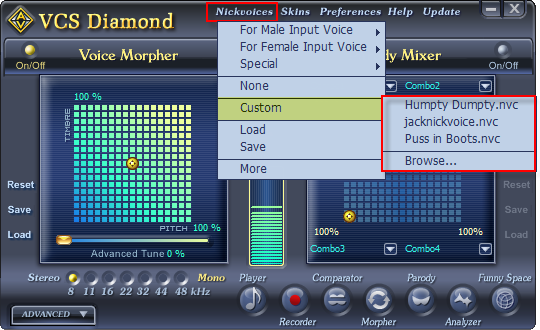 In this tutorial, we will show you how to load a pre-saved Nickvoice to use in AV Voice Changer Software Diamond 7.0. Besides loading a nick voice, you can also customize and save your own nickvoice for later use, or conveniently put it into the menu for fast selection. On Voice Morpher panel, choose Load (1). 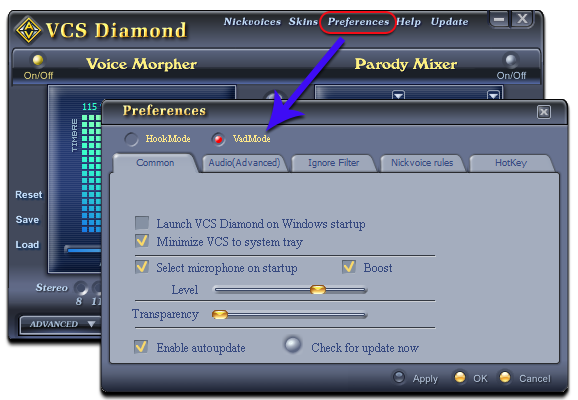 Choose the Nickvoice, and then click Open to load the nickvoice preset in to AV Voice Changer Software Diamond 7.0 (3). The nickvoice will be immediately loaded into the Voice Morpher’s Pitch and Timbre graph. Note: You can also use this as basic and make further modification to the voice with other features of AV Voice Changer Software Diamond 7.0. If your nickvoice file (.nvc) comes along with advanced settings, you also need to load Equalizer (.eq), Effects (.efs), Formant Morpher (.fmnt) … files. 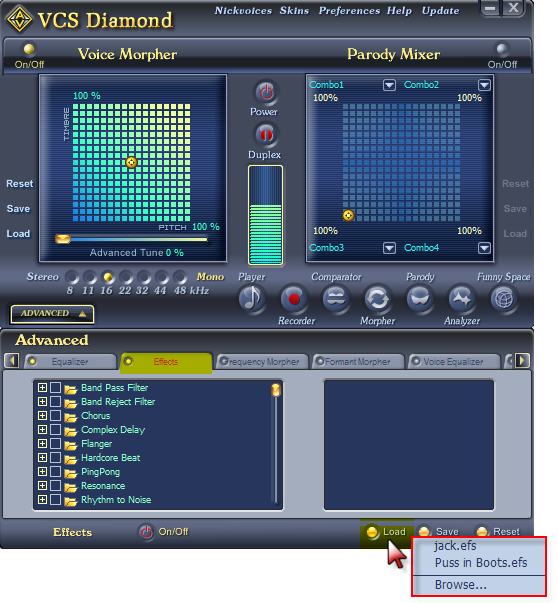 AV Voice Changer Software Diamond 7.0 is famous for its morphing quality. With Nickvoice, you can change voice in one click with the ready-to-use voice presets. But did you know? You can also import a Nickvoice from our add-on library to the menu software. With this, you will be able to select the Nickvoice very quickly from the menu every time you want to use it. 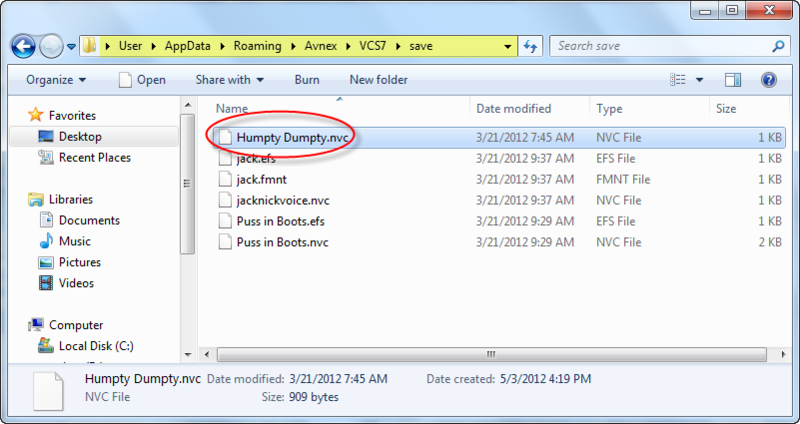 This is where the Nickvoices are stored within AV Voice Changer Software Diamond 7.0. “Save” folder is the location where the configuration is stored. Once the nickvoice is imported into this folder, it will automatically be added to menu ‘Nickvoice’>> Custom in AV Voice Changer Software Diamond 7.0. Hope that you guys enjoy this tutorial. Did you know? 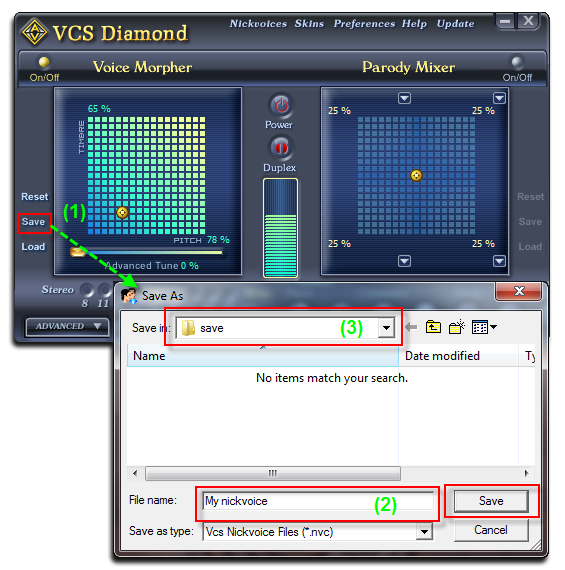 AV Voice Changer Software Diamond 7.0 can also record your voice with different voices. In this tutorial, we will show you how to record your changed voice and normal voice. On the main panel, select the Stereo / Mono scale either left or right to choose which settings your records will use. Most of the time, we use Stereo. In this illustration, the position of (1) shows that the file will be saved in Mono type with 16000 bits. Note: Only when the DUPLEX mode is ON (2) that you can make change to the Stereo/Mono scale. If the DUPLEX mode is off, it is because there is a playback audio stream(s) in your computer, please turn off any media player or any application that is producing audio stream at that time. 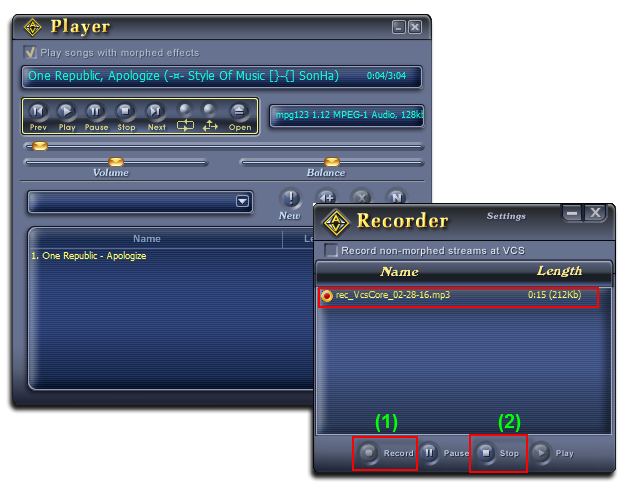 After choosing Stereo/Mono, click on Recorder button (3) to open Voice Changer Software Recorder. Click the Encoders tab to switch to this tab. 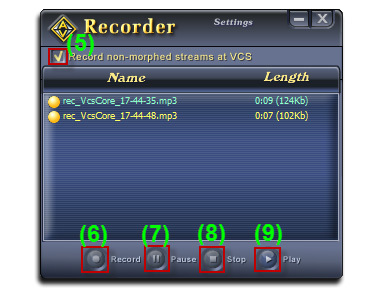 Tick on the Advanced mode checkbox (3) to show the full list of audio rates supported by VCSD Recorder. Click OK to save settings and back to the Recorder dialog box. 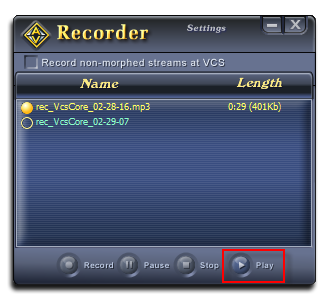 Tick on the Record non – morphed streams at VCS (5) if you want to record your original voice. Otherwise, the software will record your changed voice. Hit the Record (6) button, start speaking into the microphone. Click Pause (7) to postpone the recording, Stop (8) to end the processing recording and Play (9) to rehear your voice. Your voice should be clear and loud enough. You should speak right after hitting the Record button, or the record file will have a silent part at the beginning. If you want to make your record more interesting, try to imitate into the character a little bit. If you want to record again, right–click on its audio stream and choose Delete. Then start recording again. We hope that you will be able to record many interesting audio file and enjoy with friends and family. 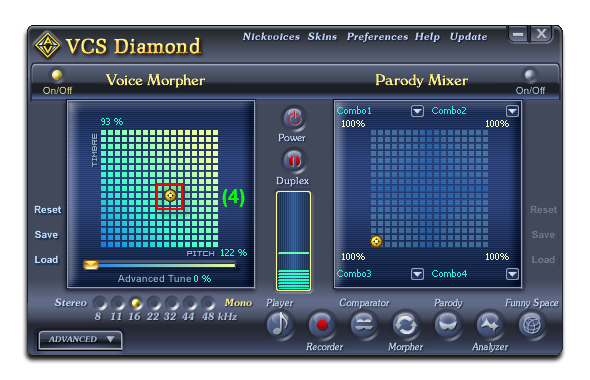 In this tutorial, we will show you how to record and morph your song with audio effects using AV Voice Changer Software Diamond 7.0. With this, you will be able to make your songs and audio files many time more interesting. In this step, simply add your software to the voice changer. 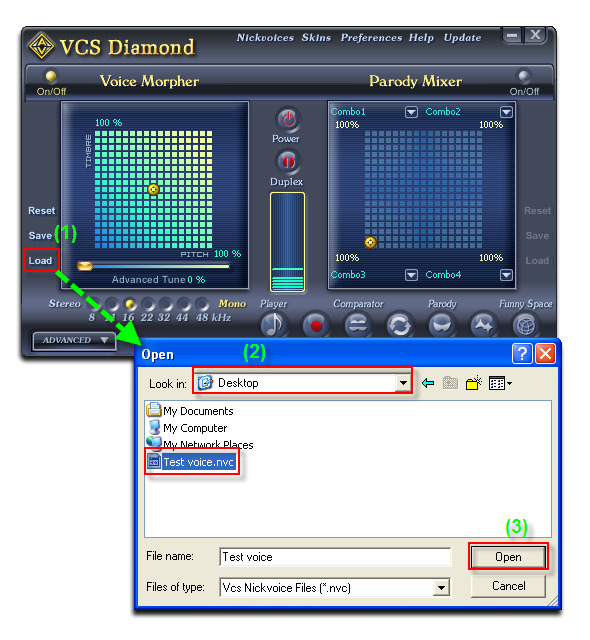 Run AV Voice Changer Software Diamond 7.0. From the main panel, click the Player button. 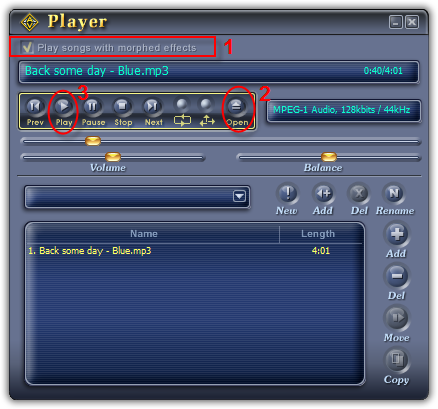 In the Player dialog box, check Play songs with morphed effects (1). This let you hear the song with all morphing effects you have set up in VCSD. Click Open (2) to open a song then Click Play (3) to play song. Click here to know about play a lists of song. 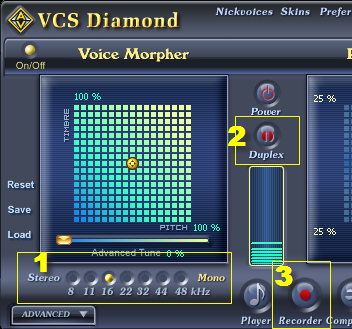 Tip: Users should have known how to change voice using Voice Morpher feature, and other voice morphing features of AV Voice Changer Software Diamond. 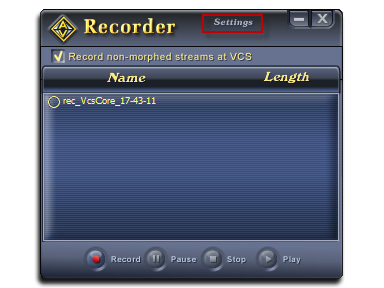 From VCSD Main panel, click the Recorder button. 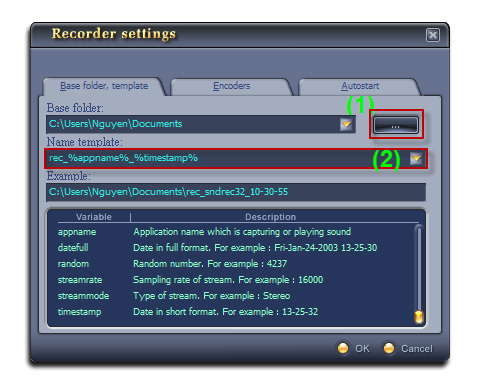 In the Recorder dialog box, click Record (1) to start recording. 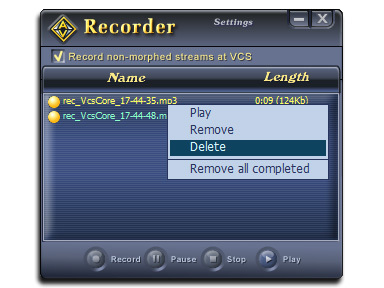 By default, VCS Recorder will record the song with all morphing effects you have set in VCS. Note: If you want to save the original song, check the option Record non-morphed streams at VCS. By default, the recording task will be stopped as soon as the song is finished. If you wish to finish recording before the song is done, click Stop (2). Note: In this tutorial, we choose the 44100, Stereo for the Encoder according to the song’s audio frequency and number of audio channel. You can select other options if needed. In the Recorder dialog box, choose the file you have just recorded then click the Play button. Note: Remember to UNCHECK the option box Play songs with morphed effects or the file will be morphed again by VCSD morphing features. With this, we believe that you are able to morph and record a song with effects thanks to AV Voice Changer Software Diamond 7.0. 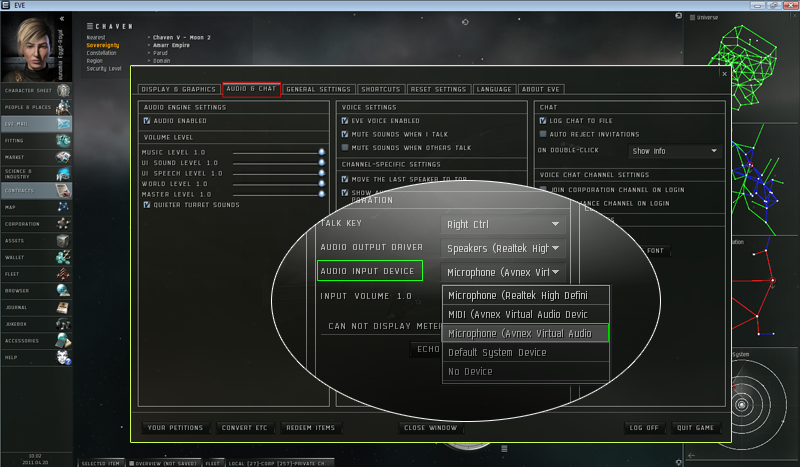 In this tutorial today, we will show you how to change voice in EVE Online with AV Voice Changer Software Diamond 7.0. Change your voice from male to female, add effects and enjoy the unlimited fun when trolling around with your pals. On VCSD main panel, click Preferences to open the Preferences dialog box. Click OK button (2) to apply the new setting and close the Preferences dialog box. Back to the main menu, simply use a Nickvoice to change your voice. Click on Close Window button to exit. 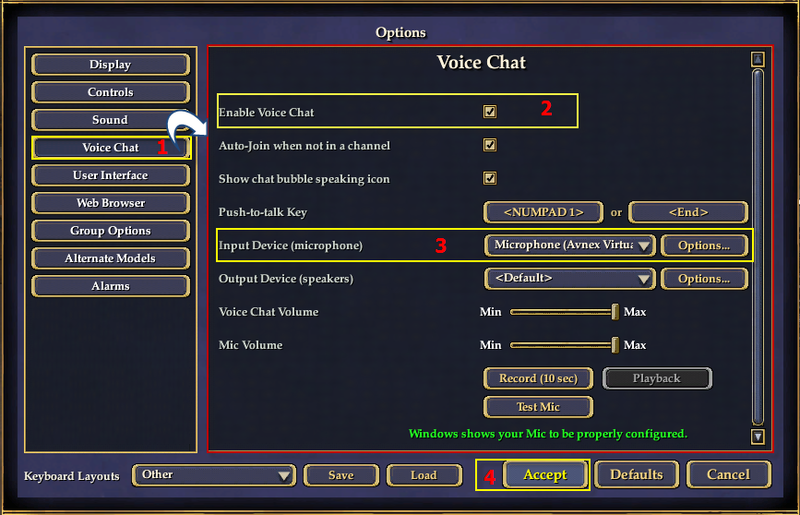 In this tutorial, we will show you how to change voice in EverQuest 2 with AV Voice Changer Software Diamond 7.0. With this, you can change voice male to female, alien, add voice effects, background effects and more. On VCSD7 main panel, click Preferences to open the Preferences dialog box. Check your microphone to make sure it works properly. Run EverQuest II, and log into your account. In the Options dialog box select Voice Chat tab (1) on menu left. Make sure that the Enable Voice Chat check box (2) is checked. Change the Input device (3) to Avnex Virtual Audio Device. Click Accept (4) to approve the new settings. VCS Virtual Audio Device is now the active audio device used by EverQuest II. And now, you are ready to rock your game. In this tutorial today, we will show you how to change your voice in Second Life with AV Voice Changer Software Diamond 7.0. Change voice male to female, robots, add effects in real time and have fun. On VCSD main panel, click Preferences to open Preferences dialog box. Click OK (2) to apply the new setting and close Preferences dialog box. Run Second Life, and log in your account. Select Preferences command (2) to open Preferences dialog. Select Sound & Media category (3). On the right panel, press Input/OutPut Devices button (4). In the Input device section, change the Microphone settings into “Avnex Virtual Audio Device”. Click OK button (6) to submit the new settings and close this dialog box. 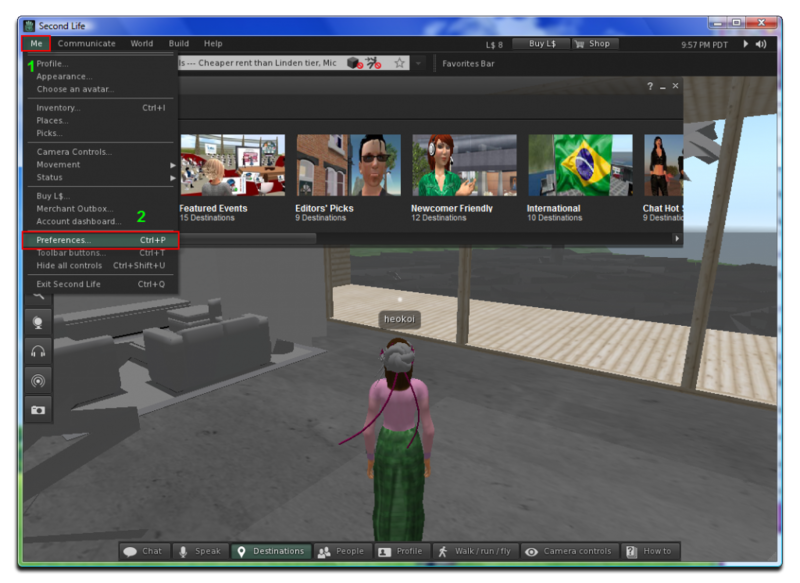 From now on, VCS Virtual Audio Device will be the main audio device used by Second Life Voice Client. It means that when you use this Microphone driver and open AV voice Changer Software Diamond 7.0 at the same time, your voice will be automatically morph with Voice changer settings. 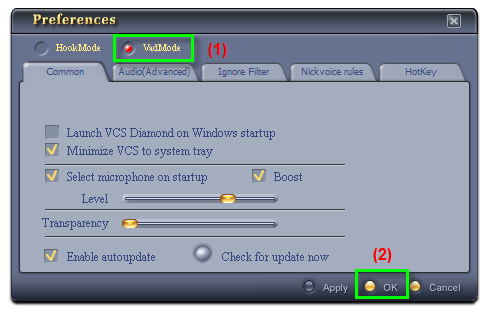 To talk in normal voice, simply reset settings of Voice Changer Software Diamond. To talk in normal voice AND without launching Voice Changer, change your Microphone driver in Second Life back to the other one.